Successfully Added 1-DIN Car DVD Bluetooth Media Center with 5 Inch Touchscreen to your Shopping Cart. 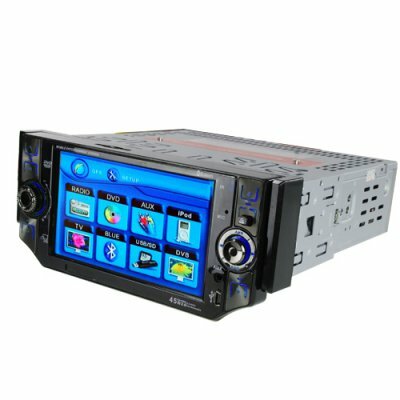 Single DIN car DVD and Bluetooth multi media center with 5 inch detachable widescreen LCD (16:9) and touch screen interface. Having a responsive 5" LCD touchscreen display with a color icon menu interface, this full featured car DVD player and multimedia center works with a wide selection of disc and digital media formats, includes a responsive Bluetooth handsfree system, has a built in analog TV tuner, frontside mini-USB and SD card slots, and rear view camera input. All these features are convenient and easy to use via the front panel buttons, LCD touch screen, or remote controller. In these tough economic times, why not save some money by staying home and doing some work on your car during your next holiday? Upgrading your car is a great way to give yourself long-term pleasure and peace of mind, and you will enjoy this car multi-media center much longer than any trip you would have taken to some crowded and overpriced tourist trap! Car touchscreen DVD + multi media player with beautiful 5 inch display. 1-DIN standard (50mm) size. Can play MP3 and MP4 files from disc (cd-r), USB, SD card, or even music files from your iPod or other portable media players. Detachable faceplate for maximum system security when you park in unfamiliar neighborhoods. Primary Function: Vehicle multimedia player and Bluetooth system with beautiful 5 inch display.